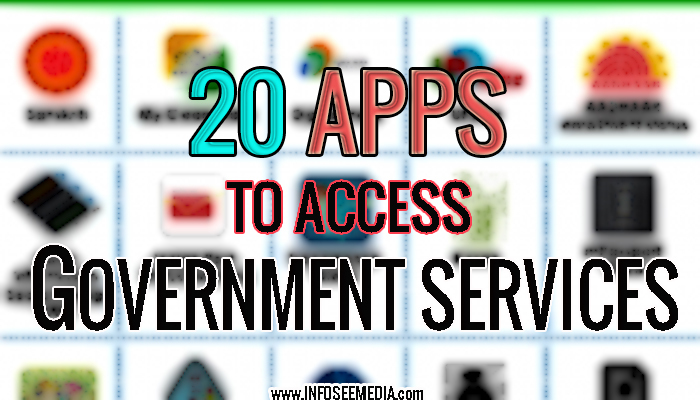 Here we shared some apps which was developed by Indian Government by using those you can access or do Government and personal services through your smartphone in some finger clicks. BHIM app was developed by National Payment Corporation Of India(NPCI). This app is based on Unified Payment Interface(UPI). Currently most of all Indian banks supports UPI so you can link your bank account with BHIM app and start sending receiving money through it. Send Money to any Indian bank account using Account number and IFSC Code. Send or receive money through UPI address or scanning QR code. Note: There is a limit that you can transfer maximum 20,000 rupees in one transaction and 40,000 rupees per day( for 1 bank account). This app was developed by Income Tax Department. Through this app you can use some services offered by Income Tax Department. Apply for PAN(permanent account number) online. Taxpayers can locate nearby TPS offices through TPS Vertical option. It has a CHATBOT in ASK IT option, in this taxpayers can ask their queries and that will be answered automatically within seconds. In live chat taxpayers can also ask their queries to the experts. You can locate your nearest TRP in just a click. This app also includes a multiple choice question answer game, by paying that users can increase their knowledge on Income Tax. This was developed by Mobile seva. This app is specially build for farmers, If you are a farmer you must download this app. Weather of current day and next 5 days. Agro advices, Plant Protection, IPM practices. Unique features like extreme weather alerts and market prices of commodity in nearest area and the maximum price in state as well as India have been added to empower farmers in the best possible manner. mKavach is developed by C-DAC and its only available for Android users. The aim of the app is to handle threats associated with mobile phones. For instance, one will block spam SMS or unsought incoming calls. Through the app one also can address malware threats that try and steal personal information and credentials. MyGov app acts as a platform for citizens to participate in governance. In this you can provide the paths to implement their ideas. You can comment or give suggestions to central ministers and associated organisation. You also can participate in policy formation. MySpped app was developed by Telecom Regulatory Authority of India. Users can check their internet speed through this app. This app was developed by Nic eGov Mobile Apps. Users can locate nearest Police Station based on their current location so that they can reach to station in case of emergency. The App displays the current location of the citizen on the Map along with details such as name of places, roads and major landmarks. It also displays numbers of SP offices and district control rooms. Trough “Tap to CAll” option users can call to the police station in case of emergency. ePathsala is an education based app developed by NCERT and HRD ministry. Through this app students and teachers can access available Ebooks on their smartphones, tablets and desktops/laptops. You can carry as many books according to your device’s storage. The app has features like pinch, select, highlight and even listening to text using text-to-speech. eParivahan was created by Ministry of Road Transport and Highways(MORTH). Get any car details by putting Car’s number like owner name, registration date, registering authority, make model, fuel type, vehicle age, vehicle class, insurance validity, fitness validity. Find details of any parked, accidental or theft vehicle by just entering the registration number. Verify your car registration details. Verify details of a second hand vehicle. If you want to buy a second hand car you can verify the age and registration details. Create virtual DL and RC. Be in touch with Startup India-Initiative and get the latest news, events, information about Startups, Incubators, IMB, State wise information, action plan and FAQs, etc. right in your hand. DigiSevak is an internet volunteering platform for interested citizens WHO need to contribute to the reason behind India. numerous government departments and establishments will produce tasks and volunteers will show interest for the tasks supported their skills and interest. The platform provides means that for end-to-end execution of a volunteering task- right from the registration of volunteers, to the creation and analysis of tasks submitted by volunteers. Remembering GST rates of various goods and services is too difficult. So you check the rate of GST of your needed good and services by searching within the app. It brings together all government services in a single platform. – More for Less: Only a single mobile app needs to be installed instead of each app of each department. – Convenience: Citizens do not even need to install or update the app again to avail government services if more services are added to the platform. – Saving of Time and Money: Citizens can anytime and anywhere avail these services through their mobile phones, desktops, and laptops without any need for visiting the department office and standing in queues. – Uniform Experience: All the government services including payment-based transactions provide secure and uniform experience. This app was developed by ministry of Tourism India. Check details of Domestic Tour Operators, Transfer operators, Travel agents,regional level guides, and classified hotels available in cities and tourist centres. Developed by UIDAI. By this users can carry their adhar identity through smartphone. Download Adhar number holder profile. This app was developed by CPV division. Know how to obtain a passport(steps). This an app from post department developed by CEPT. Tracking parcels or posts with tracking code. :: Syncing of IRCTC’s NGeT WebSite and NGeT Mobile App tickets. Now users can view, cancel or file TDR of e-tickets booked through official website (www.irctc.co.in) and vice-versa.